Like a lot of people, when I first began developing on a “proper” Operating System (as opposed to the 8 bit computers I started with), sooner or later I convinced myself I’d found a bug in the operating system. Of course I’d be wrong, and after suffering the embarrassment of discovering that it was my own stupidity, rather than an OS bug, that was causing the errors, I eventually acquired an automatic reflex to never ever believe that there was a bug in the OS. It had to be a bug in my code. This was a good thing, since I was always right. Despite this, it seems that I never fully learned this lesson. And so it was that last May I opened a bug report on Microsoft Connect, fully expecting to be gently, but firmly rebuffed, with an explanation of where exactly I’d gone wrong. The issue that I was facing was in detecting whether a connection to my web application was coming from the local machine (running the web application), or from a remote machine. I was calling the HttpListenerContext.Request.IsLocal method, and it was always returning false, even though the client was definitely local. A little digging with Reflector showed that the method was implemented using “==” to compare the local address with the remote address, instead of the Equals method. If the “==” operator had been overloaded then it would have worked. A couple of days ago, I got a message saying that this was indeed a bug, and that it was fixed in version 4.0 of the .NET framework. So it looks like I have finally actually discovered an honest-to-goodness bug. Or perhaps they are just being kind to me. This entry was posted in Debugging on February 14, 2009 by damian. 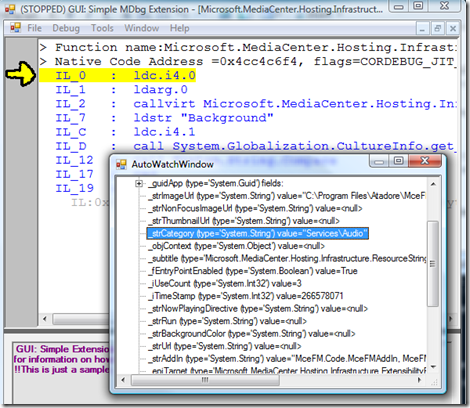 In this post I’ll show how you can inject your own .NET code into a process that is already running the .NET framework. I needed to do this when developing for Windows Media Center because there is no official documented way to determine what page is currently being displayed in Media Center. I wanted to know when the user is showing the Media Center “now playing” page. 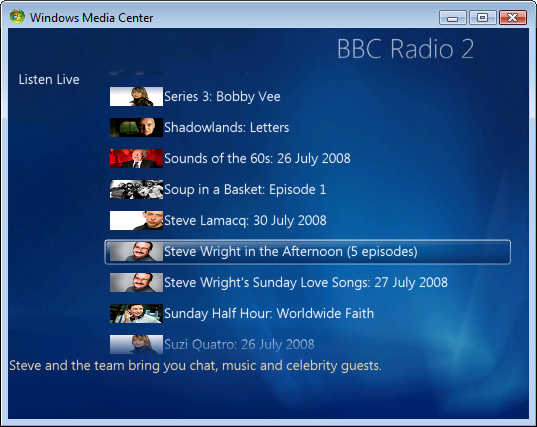 Media Center addins run in a completely separate process to the main Media Center process, which is ehshell.exe. Calls you make in your addin are remoted across to the Media Center ehshell.exe process. What is more, there is a static PageBasedUCPService.DefaultUCP method to return a PageBasedUCPService instance. There are of course a couple of problems. The first problem being that these classes are internal to the ehshell assembly, the second issue being that these are all running in a totally separate process to my addin. I searched a little, and came across this example showing how you could use the CreateRemoteThread from .NET to inject your own native code into a remote process. 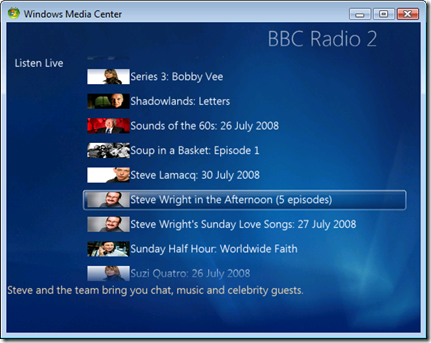 Essentially it opens a handle to the remote process, finds the LoadLibrary system call’s address in the remote process, allocates a chunk of memory in the process, and fills the memory with a LoadLibrary call to load a DLL that you specify, and then creates the thread in the remote process, passing the address of the chunk of memory as the starting point for the thread. I recommend taking a look at the CRT call in the example. I’ll not be duplicating the code here. Finally we come to the Injectee class, which is loaded by the DLL, and runs inside the remote (ehshell.exe) process. It is in a strongly named assembly which is stored in the GAC, so that the bootstrap call above can find it (note the strong name in the assembly name bstr). // of the new event. // Use whatever interprocess notification mechanism you wish. // addin has a web server in it to receive these calls. All this means that if you are a Last.fm user and want to tell Last.fm that you love a track that is currently playing then you can press the right-button on your remote control on the “now playing” page using my MceFM addin. Word if warning. If/When Media Center changes its internal structure this technique will completely fall over. Use sparingly, entirely at your own risk, to do the seemingly impossible. This entry was posted in Debugging, Media Center on July 2, 2008 by damian. Using mdbg to debug at the MSIL level instead of assembly code. 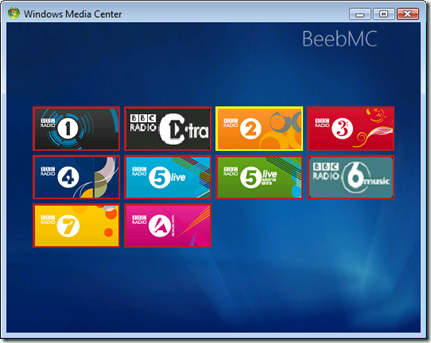 Windows Media Center (MCE) lets you create addins to provide new functionality. There are two kinds of addins — normal addins, and background addins. 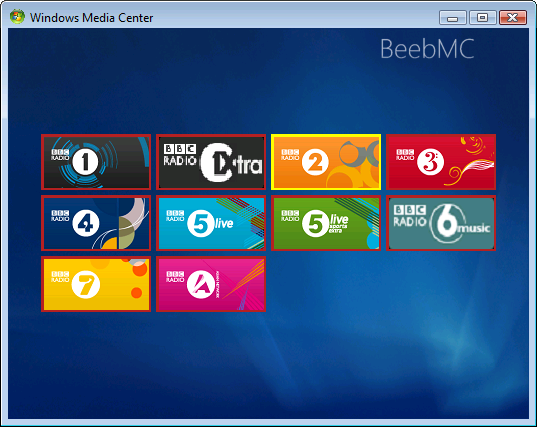 Background addins run continuously as soon as MCE starts up, and are limited in the user-interaction they provide. 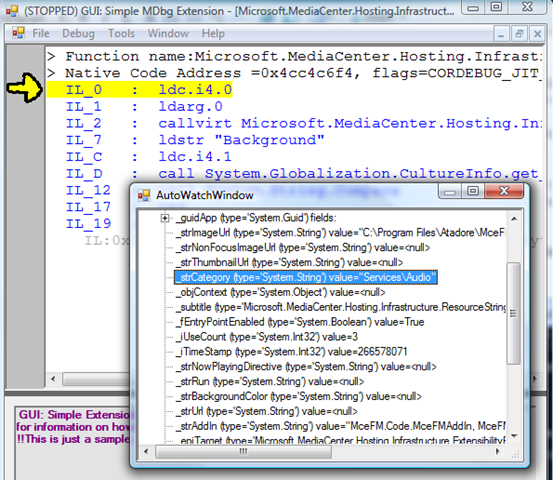 One thing they are allowed to do is to pop up a dialog message to the user using the AddInHost.Current.MediaCenterEnvironment.Dialog(…) method call. I was doing this in my background addin, but I was getting an error from MCE saying that I was not allowed to make that call. Addins run in separate processes to the main MCE process, which is ehshell.exe, and the Dialog call is remoted into the ehshell.exe process. Somehow I needed a way to use the debugger to see what the epi.Category value was when the call was failing. The standard Visual Studio debugger just drops you through to x86 assembly code if it has no debugging symbols. I needed a debugger which shows .NET IL instead. This is where mdbg comes in. Mdbg is a command line debugger created by Mike Stall. Once you have downloaded it and started running it, then you can use the ‘a‘ command to list available processes, and then ‘a <pid>‘ to attach to a specific process. This entry was posted in Debugging, Media Center on June 12, 2008 by damian.